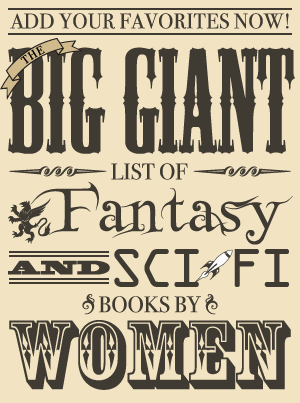 This is part two of my review of this collection of novels. It was originally meant to be one review of the entire omnibus, but it ended up a little wordier than I had hoped so I split it up. The first part is here. This part has the introduction to Of Darkness, Light, and Fire and covers the second book in it, The Fire’s Stone. Of Darkness, Light, and Fire is an omnibus containing the third and fourth novels written by Tanya Huff, who has written many more novels since the first of these two was published in 1989. Both novels in this collection are completely unrelated books with no sequels or prequels. Gate of Darkness, Circle of Light is a contemporary fantasy set in Toronto, and The Fire’s Stone is a more traditional quest-based fantasy. These two novels are out of print now other than in this collection. A wizard, a thief, and an alcoholic prince – all with serious issues with their fathers – undertake a quest to save Ischia from imminent destruction. The volcano in Ischia is held back by a magical stone, but it was stolen and the only hope of saving the city is discovering the location of this powerful item and returning it to its proper place. Prince Darvish has largely been left out of princely duties due to his unfortunate birth as the third son instead of the heir or the backup heir. Instead, he’s turned to being the drunken life of the party and when the stone is stolen, his reputation allows him to get into seedy areas to investigate without anyone thinking twice about it. Also, he has experience with thievery on his side due to his recent rescue of the thief Aaron, who was to die for his crimes. He and Aaron are later joined in their search by Chandra, a princess betrothed to Prince Darvish. Chandra traveled to Ischia just to tell Darvish that she cannot marry him since she is a Wizard of the Nine who must focus on her studies. However, when she hears the stone is missing she blackmails Darvish and Aaron into letting her accompany them – after all, they may need a wizard and she feels it is her responsibility help retrieve the legendary stone created by other Wizards of the Nine. 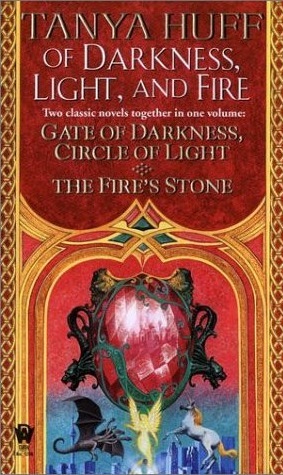 The Fire’s Stone is the more character driven of the two novels in Of Darkness, Light and Fire and it is definitely my favorite of the two. It’s a fairly conventional epic fantasy story in which a group of characters set out on a quest to save part of the world, but Aaron and Darvish made it very worth reading. Chandra, however, irritated me to no end for a while, although she did grow on me more as the story progressed. It was a good thing Aaron and Darvish were so interesting from the start because there were several times I thought if I read her saying or thinking, “I am a Wizard of the Nine!” again I might throw the book at the wall. By the end, Chandra was even somewhat likable as she seemed to ease up on the attitude and also had remarkable courage. There was a nice camaraderie among the three, especially by the end when they had all worked through their various struggles some. Each of the characters had a big problem that he or she had to deal with throughout the story. As the third prince, fun-loving Darvish was overlooked and his father never gave him a second thought. The competent, charismatic thief Aaron left his home because his father killed the woman he loved, and he’s dealing with his feelings for Darvish after being taught all his life that homosexuality was wrong. Chandra just wants to be an all-powerful Wizard of the Nine with none of this princess stuff her father is foisting upon her. While the plot was fairly generic epic fantasy with a quest to save part of the world, the characters of Aaron and Darvish made the book. They both began with various struggles, but throughout they developed and changed. In spite of the fact that Chandra was quite annoying at times, these two made this well worth reading and Chandra also became more likable by the time the story was finished. Where I got my reading copy: Gift from a friend who really wanted me to read The Fire’s Stone.